Lisk is a blockchain platform that allows other developers and projects to build upon it. 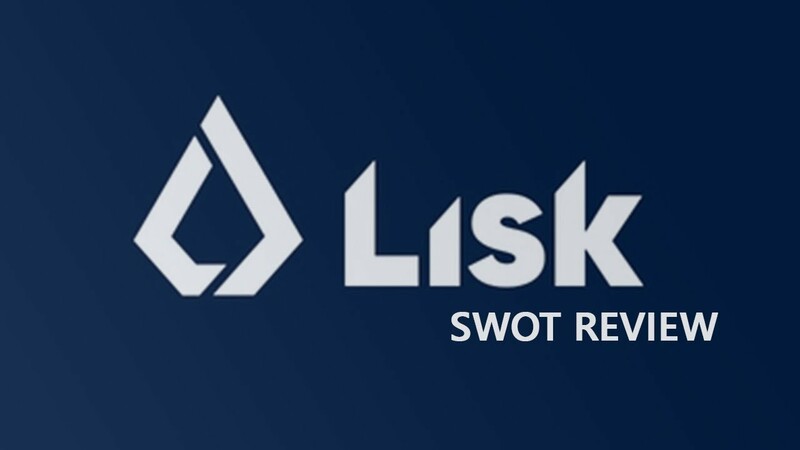 In today’s post, we’re going to take a detailed look into Lisk and its business model by performing a Lisk Coin SWOT review. As a standard business practice, a SWOT review entails studying the strengths, weaknesses, opportunities, and threats of a particular business model. It’s a great way to get a nice overview of a coin you might be considering. Much like Bitcoin, Ethereum, Litecoin, and others, Lisk will operate on a public blockchain. Essentially, all of these offer block explorers, allowing anyone to view transactions and other information occurring on the network. To see a history of transactions, simply visit Lisk’s block explorer. Lisk will use delegated proof of stake as its consensus mechanism, essentially allowing holders of the tokens to become active delegates. Each delegate is rewarded in Lisk tokens for confirming blocks. The Lisk token can be classed as a utility or functional token. Its primary purpose is not to be used as a cryptocurrency, but as a mechanism or access token for developers to use the Lisk ecosystem. Now that you have a general idea about what Lisk has to offer, let’s get straight to the SWOT coin review. Lisk is an ecosystem, where the strength of the platform will grow over time as more DApps are built upon it. Its unique blockchain architecture allows Lisk developers to fully customize their own blockchains or ‘sidechains.’ In contrast, DApps using the Ethereum platform must use Ethereum. This unique architecture will allow Lisk to be scalable in the future as more DApps are built on it. The platform has been in development for nearly 2 years, which is a long time in cryptocurrencies. Lisk’s Delegated Proof of Stake consensus mechanism is a low energy and low resource method of confirming transactions, as compared to Proof of Work system used on the Bitcoin Blockchain. Lisk uses a Schnorr signature-based scheme, which is said to allow faster, more secure transactions, potentially allowing up to hundreds of thousands of transactions per second. The Lisk Nano wallet is simple, clean and easy to use. When I tried transferring LSK, it took approximately 1-2 minutes to arrive, which is very fast. Lisk runs on a permissionless public blockchain, allowing anyone in the world to view transactions on the Lisk network at any time. Lisk has a strong team of 28 staff, many of which are developers, engineers, and strategists. The team has country ambassadors ready to help promote Lisk in foreign countries, another big positive. The Lisk team has been transparent. During the beta stage, they encountered issues but communicated well with their community in blog posts addressing the issues. The Lisk tokens are currently 115.6M, which is low in comparison with other DApp ecosystems. The supply of tokens will increase over time via block rewards following a linearly decreasing scale over the lifetime of the network. As a result, an economic incentive for Lisk participants to operate a node is provided. The block reward is 5 LSK and will decrease by 1 LSK every 3 million blocks, occurring about once a year and equating to about a 15.7% inflation rate for the first year. Node operators will also get a share of the transaction fees. Lisk is open source, meaning anyone in the world can view the source code, critique it, and suggest development improvements. Lisk has had a Github account since February of 2016. Additionally, there are regular, recent commits from a number of developers. The tokens are a requirement when developers wish to build DApps on the platform. On top of that, tokens are the means for all transaction fees. Together, these two uses give a reasonable expectation of token appreciation over time as the Lisk ecosystem grows. The team focused on developing the platform before getting going with major marketing. A brand overhaul was for the 20th of January, 2018. The Lisk project has been slower to the market with a working product when compared to other DApp ecosystems like Ethereum or NEO. After 2 years of development, a software development kit is still not available. Because of this, no one can build DApps quite yet. There were some community and investor issues upon notice of multiple delays in the SDK release. It was due for release in 2017. The fees when sending LSK are at 0.1 LSK. At current market rates, this is around $2.60. Basically, the fees are not cheap at all when compared to other cryptos. Lisk has the opportunity to become one of the top tier DApp ecosystems. If this happens, it gives a high probability for token appreciation to crypto investors over time. Until the SDK is available, there is the threat that investor and community confidence may fall. Especially if the team plans on pushing deliverables back further. DApp ecosystems like NEO, which also offer application development in Java, could outcompete Lisk as an ecosystem. Lisk is a newer blockchain model using unique side chain technology. Given that, there’s the threat a system error may occur, potentially disrupting the network. The combination of NEO, Ethereum, EOS, Cardano and IOTA outcompete Lisk for market share.